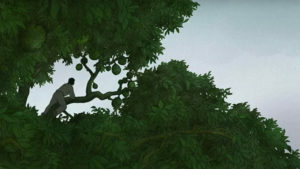 Co-produced with Studio Ghibli, Michael Dudok de Wit’s first full-length animated film delves into the life of a man who finds himself marooned on an island after a storm, as he desperately searches for a way to escape. Unfortunately, his attempts to leave the island are continuously thwarted by a large red turtle, and each bamboo raft he makes is destroyed before the island is even out of sight. Enraged by the turtle that is keeping him trapped on the island, the man exacts his revenge when the creature comes ashore, only to be filled with remorse by his actions after his rage has abated. From this encounter springs an incredible story of transformation, and an examination of a person’s place in nature. 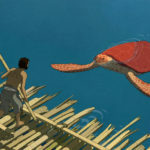 The Red Turtle is a film with little dialogue and the main characters never speak unless they cry out for help, or yell in frustration or worry. 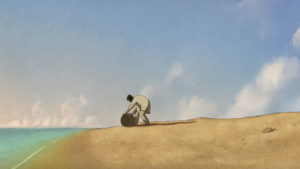 However, thanks to some incredible animation and visual choices in the film, the characters and tone of The Red Turtle are never difficult to understand despite the wordless storytelling. It’s basically a whole film of those quiet moments between action and silence that are present in Studio Ghibli films, with small actions being illustrated with care and dedication alongside the large ones. Despite this silence from the human characters (or perhaps thanks to them), there are many moments of intensity to appreciate. The man’s anger at the turtle was something I found incredibly chilling, and I was holding my breath at one point when he fell through some rocks into a watery cavern. The silence really adds to these moments, as there is no dialogue to distract from the actions happening on screen and nothing to distract from the turmoil. This in turn makes the film so much more stunning, as the story conveys the emotion it needs to by the carefully animated movements of the island’s inhabitants, by the lighting of a scene, and by the implementation of stillness. 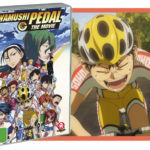 The animation in the film balances a simplistic rendition of humans and animals among detailed and textured backgrounds filled with nature. This makes sense, as like many Studio Ghibli films before it, the emphasis of The Red Turtle is both thematically and in regards to animation, focused on nature. 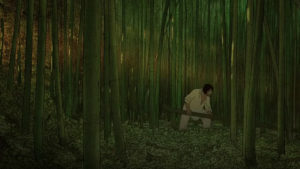 This really shows in the visual style of the film, as the characters are very basic in appearance with only two black dots for eyes and very basic lines for their noses and mouths, while the bamboo, trees, pools, and ocean in the film are detailed and full of colours and texture. 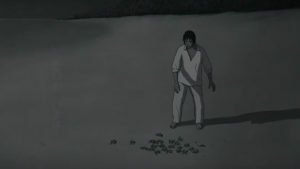 In addition, there is an explicit smallness to the human characters in The Red Turtle, as closeups are few and far between and it is far more common for them to be a small part of the frame; in this film nature is the focus and humans are the specks within it. Thus, the man marooned on the island is subject to nature and its whims, whether that be the weather, the materials available on the island, and the elusive red turtle itself that affects his life so irrevocably. 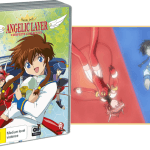 The DVD also comes with a second disc full of special features, including Dudok de Wit’s other animated works. There are three animated shorts in total, ‘The Aroma of Tea’, ‘The Monk and the Fish’ and his Academy Award winning short ‘Father and Daughter’. 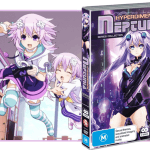 They are all different from each other, aside from the lack of dialogue and an emphasis on music. ‘Father and Daughter’ feels the most complete as a story, but each short is enjoyable in its own ways. ‘The Monk and the Fish’ feels a little bit like a slapstick routine, while ‘The Aroma of Tea’ is more of an experimentation of medium, being drawn entirely with tea. 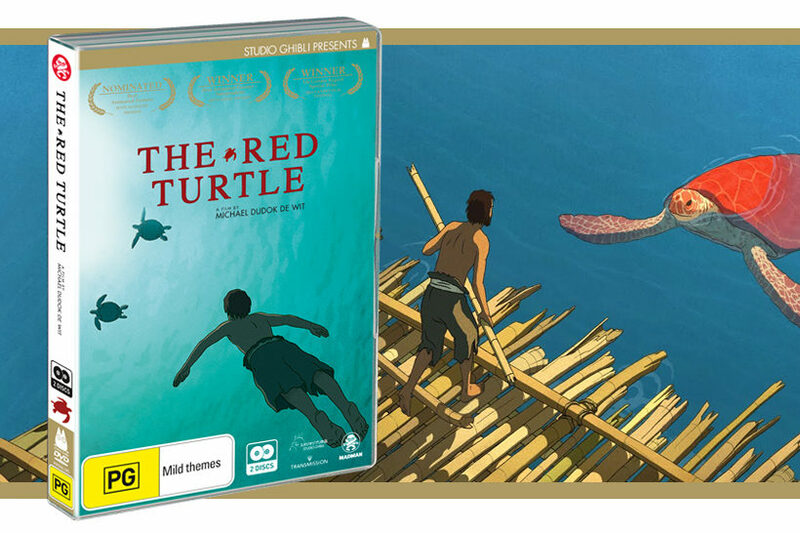 The special features also include a drawing lesson with Dudok de Wit and a very interesting ‘making of’ documentary that he personally narrates that delves into the production of The Red Turtle, how the animation style was decided, and other interesting tidbits and side stories. As Dudok de Wit says in the making of documentary, The Red Turtle is a story about mysteries, but not necessarily their answers. Perhaps this makes the film sound dull, as a story without dialogue and concrete answers has the potential to seem pointless and uninteresting. But The Red Turtle is nothing like that, and manages to feel both thematically and emotionally complete upon its conclusion, exploring the power of the natural world and the smallness of people within it in a visually stunning manner. This film was an experience, one I urge you to take for yourself.